Easy. Affordable. Streamlined. Your best value in practice management software. Why spend time tracking down patient files and invoices when you could be delivering care? Advantage+ provides a feature-packed basic package to improve your workflow easily and cost effectively. Create customized templates for all medical processes and allows you to import lab results and images directly into the medical record. Manage all aspects of vendor interaction including inventory tracking and purchase history. Manage all features of reserving space and boarding patients even customizing cages by species, weight, size, etc. Take ImproMed® Advantage+ Practice Management Software on the road! This tool allows you to synchronize all client information with your office and your mobile device. Transactions, patient records, appointments and more are displayed in an easy user interface. 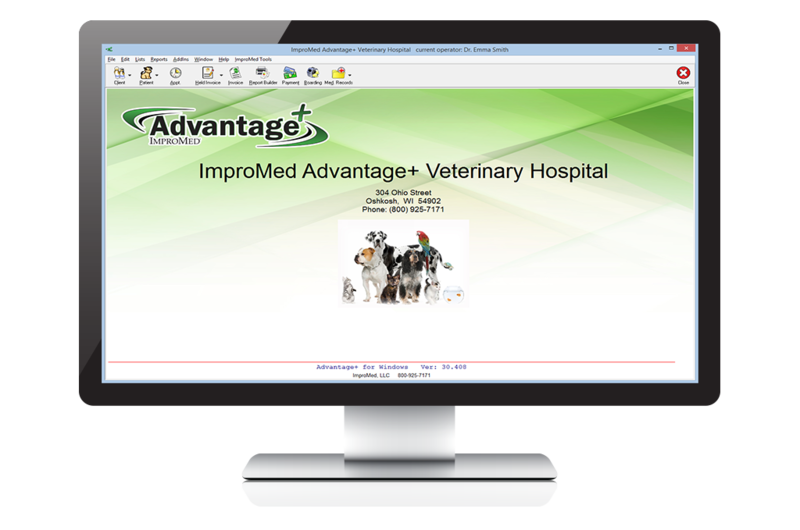 If your team can use Windows, they can use Advantage+ Practice Management Software. Imagine getting low stock warnings and being able to track consumables? With Advantage+ Practice Management Software you can and set-up is a snap! Just a few clicks and you quickly apply multiple providers, service dates, discounts, rates, and services PLUS track client balances at your fingertips. Prescriptions are saved to a patient’s medical history and the system provides auto prompt, fill on the fly and prints labels. Each Advantage+ package includes phone and internet based education. Why should you choose Advantage+? Perfect for the practice that has been trying to integrate software from different vendors OR if you’ve been putting off a software upgrade. ImproMed’s Advantage+ Practice Management Software moves the information to a secure digital platform that puts information at your teams’ fingertips. You spend more time delivering quality patient care when information is accurate and accessible.